In accordance with California Rule of Court 1.100, it is the policy of the Superior Court of California, County of Sonoma to assure that qualified individuals with disabilities have equal and full access to the Judicial system. 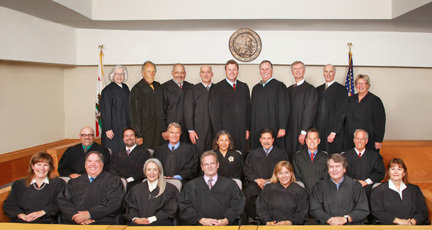 The Superior Court of California, County of Sonoma provides programs to serve the Community. DUI Court in Schools is a collaborative outreach project that brings a real DUI sentencing hearing to schools. Common answers to common questions. Frequently asked questions regarding General Information about the Court and Court Services provided. Court appointed Spanish interpreter services are available daily for Criminal, Traffic, Juvenile, and some Family Law matters. Interpreter services in other languages (including sign languages) are available on an as needed basis. The Superior Court of Sonoma County operations are conducted at three locations: the Main Courthouse, the Civil and Family Law Courthouse and the Juvenile Justice Center. Many opportunities are available. With 18 Judges and 5 Commissioners serving 450,000 residents. Sonoma Superior Court provides trial jurisdiction over all felony, misdemeanor and traffic cases and all general civil cases. Pursuant to Government Code §70200, the Superior Court for the County of Sonoma is divided into a criminal division, a family law division, and a civil division which are governed by the Local Rules. Any media agency submitting a request to film or photograph inside the courtroom must follow the Policy and Procedures outlined in Sonoma County Local Rule 21 and California Rule of Court 1.150.